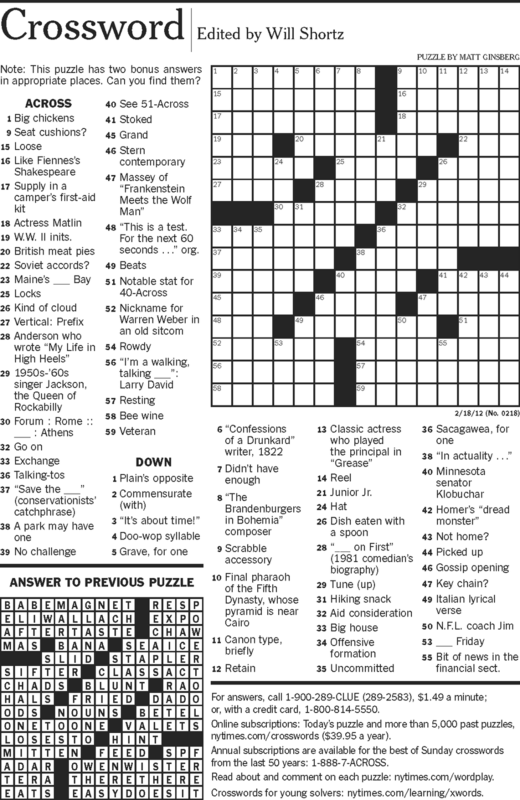 Interesting stuff in the Sunday NYT. On the editorial page, A Million Jobs, concerning the GM/Chrysler bailout. One could make the case that this was just an efficient reorganization that used the power of the government effectively. In any bailout, we should be worried about moral hazard, but in this case maybe the alternative was a private sector "reorganization," under which some organizational capital was lost forever. And you could add in Krugman's complementarity arguments. What do you think? Give me a counter-argument. It looks like Romney will win the nomination, but he is going south (and that's not to Alabama or some such) with regard to November. I think his biggest problem is that he would probably score zero on this test. How do we want to think about financial crises? We have some idea that there is something unusual going on - something we might see every 15, 20, or 30 years, say, in a given economy. But what is the process that drives a financial crisis? How does the phenomenon get started, and what propagates it? I'm teaching a second-year PhD course, which is basically financial crisis economics. I gathered together a set of papers, some of which I had seen, and some of which were on conference programs, the key filter being that these papers had to have been somehow inspired by the financial crisis. The list includes two of my own papers, one of which is not quite ready for public consumption (maybe in a month or so). Here's an idea that struck me in class last Thursday. There are basically two ways to think about financial crises, or the process by which financial factors affect aggregate economic activity. The first is indeterminacy. This is the basic idea behind Diamond and Dybvig's (JPE, 1983) banking model. A bank run, or a panic, is a bad equilibrium. There is a good equilibrium in which the panic does not happen, but there may exist an equilibrium where everyone wants to run to the bank to withdraw his or her deposit, under the self-fulfilling belief that everyone else runs to the bank. The paper by Ennis/Keister on my reading list (and their other recent work) gives you a nice summary of where the Diamond-Dybvig literature went. The second process potentially driving a financial crisis is amplification - the idea that financial factors can amplify a small shock to the economy and make it a big one. That's the idea in the "financial accelerator" literature, which evolves from early work of mine (JPE 1987), Bernanke-Gertler (1989), and Bernanke-Gertler-Gilchrist. I think the upshot of that literature is that there is not much propagation. However, there's an idea in my JPE '87 paper that Larry Christiano has used empirically, which seems to get some mileage. In a costly-state-verification world (which gives rise to non-contingent debt under some circumstances), more risk will be bad even if economic agents are risk-neutral. Christiano measures the importantance of "risk shocks" for business cycles and finds that the shocks are important in general (and not just in the past 4 years). What struck me is that my idea of what the real estate bubble was and Jim Bullard's view are quite different. My view is that the bubble was about amplification. A piece of the price of houses is always due to a type of "monetary bubble." Equity in a house is collateral which can be used by the homeowner to borrow; the mortgage on the house can be packaged as a mortgage-backed security, and that security can be used in financial exchange, and as collateral, perhaps multiple times. Thus, through an amplification effect, the housing collateral potentially supports a very large quantity of credit, and that feeds back into housing prices. The financial crisis was about incentive problems that caused the monetary bubble to be larger than was socially optimal, and once financial market participants caught on, that piece of the bubble burst. Bullard's view is essentially indeterminacy. The real estate bubble was a self-fulfilling good equilibrium, and now we're in a bad one. The two views get us to the same place. I.e. potential GDP is much smaller than the Old Keynesians are telling us. What you see may be what you get. However, the policy conclusions implied by each view could be quite different. Addendum: See this paper by Dorofeenko/Lee/Salyer on how risk shocks are propagated through the housing sector. Dylan Matthews, at the Washington Post has some funny ideas about what "Modern Monetary Theory" is. The modern monetary theory in the article appears to be some kind of post-Keynesian movement. Does anyone know what this is about? My coauthor Randy Wright would probably have a cow. Please don't tell him. Bet u wonder How i managed pull that off, eh? I do not understand why Moses doesn't have an overall rating of 5.0. He is an AMAZING prof, utterly hilarious and interesting. Yes, his tests are hard, but its university...just study a lot and read the questions carefully and you will be fine. I always looked forward to his class, and I still find I talk about him probably once or twice a week! This even shows you something about the weakness of student evaluations as an input to compensation and promotion and tenure for professors. Clearly, if Richard scores low on evaluations it is because he is challenging the students. The ones who are complaining are those for whom getting off their butts is painful. I also know how good Richard is because he told me about how he teaches. He has some particular techniques for dealing with large lectures. One I remember is that he does not post lecture slides, if he uses them, and forces students to write down what he is teaching them in class. Prepared slides that are posted on a web site represent an open door to skipping class, and for good reason. In that context, the Professor might as well be a TV. Richard, like many commenters on this blog, is not sure what economists have to contribute. He's even suspicious that we might be a serious tax on society. Economists get this a lot from other parts of the university. We're relatively high paid, so if we're really not doing much for anyone, why not get rid of us and use the resources more efficiently? In the New York Times this morning, I read about the recent record set in a chain of kidney transplants, involving 30 kidneys and 60 people. Here's the problem. Each of us really only needs one kidney, but we are born with two. However, giving up one involves a risk. There is the pain of the surgery, the risk of infection, and the lingering doubt one might have that there may be a good reason why we actually have 2 kidneys. But, when renal failure happens, it's typically both kidneys, and ultimately the only way to save the person may be a kidney transplant. If we can just share our kidneys around, though, that would be great. In the human race, we have more than enough to go around. How would an economist solve this problem? Plenty of allocation problems we have can be solved by using the idea that markets solve the problem. Pricing parking spaces appropriately can allocate scarce parking lot space in a university. We can solve pollution problems efficiently in some cases through the trading of the rights to pollute (cap and trade, for example). The application of auction theory to the problem of allocating broadcasting bandwidth and resource extraction rights has been one of the big successes of economic science. But we're not going to use conventional markets to solve the kidney exchange problem. Just think about it a bit, and you'll understand why we can't go there. One bright man figured out a solution. That guy is Garet Hil, and I've linked to the only information I can find on him, which is an account of a photo shoot. Garet Hil has an MBA from the Wharton School, at the University of Pennsylvania. He doesn't call himself an economist, but that's essentially what he is. His key training is in computer science and finance, but as any economist knows, the economics group at Wharton is quite high-powered. To solve the kidney exchange problem, one has to start with a list. That list consists of two sub-lists: a list of donors and a list of recipients. What motivates a donor is typically an interest in a particular recipient on the list, though some donors are just generally altruistic. Now we have an allocation problem. Every donor does not match with every recipient, for various reasons. Indeed, the recipient who motivates the donor may not match. Thus, the trick is to construct a chain of matches from the two lists. For example, A and B are donors. C and D are recipients. A cares about C and B cares about D, but A and C do not match, B and D do not match, but A matches with D and B matches with C. We do two transplants, and everyone is happy. This extends to much more complicated chains, involving many people, and Hil wrote a general algorithm to solve the problem. As luck would have it, I actually saw a presentation on kidney exchange by the expert in the field, Al Roth, Harvard University, at Wash U a couple of months ago. Al Roth has many interests, including the application of high end game theory and the theory of matching, to market design. My colleague, David Levine, is interested in high end game theory, but is interested in many other things as well, including what Al Roth does (side note: explore David's web site, particularly his take on modern behavioral economics). Another example of market design is the allocation of medical residents to medical schools, which has been studied extensively in the economics literature. In this year's new-PhD job marktet, we have had campus visits with economists involved in market design, including SangMok Lee (Caltech), who is a theorist, and Clayton Featherstone, (Stanford), who is doing a post-doc at Harvard with Al Roth. The key idea we want to extract from kidney exchange is that there are ways to improve on Hil's algorithm, and economists can contribute in important ways in thinking about other kinds of organ exchange, which have their own unique problems. For example, donating some organs would kill the donor. You can see where the research is going on Al Roth's web page. I hit on an idea when I was talking to SangMok on Thursday, just before I had to run off to class, and then get on a plane to Atlanta. SangMok was working on an allocation problem that is in some sense easier than the kidney exchange problem, but nevertheless quite difficult. SangMok is studying a problem like the allocation of medical residents to schools, where residents have preferences over schools, schools have preferences over students, and we are interested in efficiently matching schools with residents, two by two. That problem shares something with the approach taken in modern monetary economics, what Randy Wright and I call "New Monetarist Economics." Some of the economic models New Monetarists think about are matching models of resource allocation. SangMok's problem involves designing an allocation mechanism to solve a matching problem. In the New Monetarist matching problem, the individual economic agents in the model world are actually working together to solve the resource allocation problem, but in an Adam Smithian fashion - working solely through self interest. For a New Monetarist, a key problem is understanding the nature of information problems and limited commitment problems (essentially people running away from their debts), that give rise to the the use of money, credit arrangements, and other financial innovations, which the economic agents in our model world discover and use to solve the resource allocation problem. That resource allocation problem is the ultimate one - what goods and services are produced, and how they are allocated across members of our society. The policy problems New Monetarists are interested in concern how governments can intervene - through regulation and monetary policy actions by central banks - to help the individual economic agents in our model do a better job on the resource allocation problem they are solving. Then we translate those results into policy advice that we give directly to policymakers like Jim Bullard, Narayana Kocherlakota, and Ben Bernanke. Now, here's an idea for the New Monetarists, or anyone else who cares to attempt a solution. We typically work on the two-sided matching problem - two-by-two matches of buyers with sellers. But suppose we think like the kidney exchange people. There is already a little bit of work on this, but it hardly scratches the surface, and may have been going in the wrong direction. I'm think of Kiyotaki-Moore credit chains, work by Lagunoff and Schreft, and some stuff I have seen by Julio Rotemberg. There's an idea out there that the financial crisis had a lot to do with the chain of credit relationships among large and small financial institutions, and the fragility of that chain. Clearly, in practice there are credit problems just like the kidney exchange problem, that you can solve through a chain of credit transactions. You can see that the kidney chains are somewhat fragile. If one donor backs out, the whole thing can fail. But it's promising that you can actually get a chain involving 60 people and 30 kidneys. That's impressive, and the analogous financial idea is that financial market chains could actually be resilient. The problem that New Monetarists have that is different, and which gives you the key to why economics can be so hard, has to do with the fact that the individuals who are solving the allocation problem in the New Monetarist world are self-motivated. They will game the system, cheat, steal, and run away, if you let them. We have to design the framework of regulation and monetary policy so that they don't do that, or don't do it much, and so that we get a nice, efficient, allocation of resources as a result. That's economics. Isn't it interesting? Central Bankers: Kocherlakota (Minneapolis Fed President), Kei-Mu Yi (Minn. Fed Research Director), Tao Zha (Atlanta Fed), Dennis Lockhart (Atlanta Fed President), Waller (St. Louis Fed Research Director), David Andolfatto (Vice President, St. Louis Fed). Just being at this conference is a wonderful experience, and very nostalgic. Sargent and Wallace sat together and whispered, trying to sort out the papers. Ed Prescott nodded off briefly, just as he did in the seminar room at the Minneapolis Fed, when I was there 1987-89. My ex-colleague Dean Corbae gave a paper. My coauthor Randy Wright, who I have known essentially since we were on the job market together in 1984 (he from Minnesota, me from Wisconsin), also presented. Valerie Bencivenga, my good friend and the widow (odd to use that word, but there it is) of Bruce Smith, my mentor and good friend. [By the way, Valerie is doing well at UT Austin, and now married to Mark Feldman, an economist and bridge champion, and also former employee of Bear Stearns during the financial crisis - another story in itself]. The sad part of the conference for me was thinking about the people who were not there with us: Bruce Smith, Rao Aiyagari, and Scott Freeman, who all died in their 40s, and Bruce Champ, a monetary historian and Minnesota graduate who is now disabled. How many times has the happened to you? Most of your very best professional friends, and essentially all of the people who you most admire, first from a distance as a student, and later as colleagues and friends, and most of the people that you learned from as a professional economist, are in the room. It's really a one-time affair. Never going to happen again. In the evening we had dinner in the Atlanta Fed's dining room. At the end of the dinner, Narayana talked briefly about Warren, then Will threw it open to the floor: open mike to allow us to give our take on Warren's contributions. I knew in advance that I would have an opportunity to talk at some point about things other than my paper on the program. I thought hard about what I wanted to say. I thought about it last week; I thought about it on the plane on the way here and took notes; I thought about it when I went for a run yesterday morning. As Valerie said, carpe diem. I had several goals in mind. I wanted to right a wrong. I wanted to give people some idea of what it was like to work at the Minneapolis Fed in 1987-89, when I was Warren's colleague - what it was like to be in that environment where so many of the important economic ideas of the 20th century were percolating. I had to do all that, and also try to get across the idea that Warren Weber is an important person in the world, and important to me. Did I do that? You'll have to ask the people in the room. But afterword, Ed Prescott gave me a hug, which made me feel really good. After dinner, I walked back to the hotel with Bob Lucas, and we talked about Alice Munro. A perfect day, and I sure hope Warren was happy, and felt good about what he gave to the Minneapolis Fed, to the economics profession, and to all of us as a companion and friend. I have taken on a job, which is to be Chair of the Department of Economics at Washington University in St. Louis, for a five-year stint beginning in July. I'm looking forward to it, and my institutional model is Minneapolis. In the early 1970s, sparked by the ideas of John Kareken, a relationship grew up between the University of Minnesota and the Minneapolis Fed. That relationship produced four Nobel prizes and some of the key economic ideas of the 20th and 21st centuries. Lesser known people like me and Warren Weber were privileged to be in that environment and to have the opportunity to contribute. If we can do anything close to what was achieved in Minneapolis with Wash U and the St. Louis Fed working together, then I will be a happy man. Warren's interests and contributions reflect the strength of the Minneapolis model. Warren is an economic historian, a money and banking theorist, a teacher, a dissertation supervisor, a macroeconomist, a central banker, and an all-around first-rate human being. He has accomplished a lot in his professional career. Indeed, we expect a lot more from him. What a pleasure to be here! Addendum: I got a funny comment that I deleted. For anyone who misunderstood what I was up to when I gave Warren his "roast," or whatever that was, this is something I learned to do when I was at Iowa. Talk to anyone who was there at the time and they will tell you about it. When I want to, I can crank myself up and do what I did on Saturday night. It's purely a piece of acting. I did not know I could do this until I learned it, and it appears to be entirely inconsistent with the Steve character that everyone knows. I can assure you that no substances were involved. As anyone can tell you, I hardly drink at all. What I consume in a year is what some people I know drink in an evening. There is never anything else running around my body, which I take good care of. As for the Neil thing, I stuck my neck out alright. Neil is an old friend, he is under-recognized in the profession, and everyone who knows him understands he deserves a Nobel. Neil is also painfully shy, and would be embarrassed by the real thing too. But, given everyone's age and the nature of the occasion, with everyone there, I just did it. If you don't like it, where were you on Saturday night? Good humor is out there, it skates close to the edge, and some people aren't smart enough to get it. You should know that by now. Charles Murray has a new book, Coming Apart: The State of White America, 1960-2010. You might remember him as the coauthor of the Bell Curve which, as I remember, did not get much respect from empirical micro people. 1.Have you ever lived for at least a year in an American neighborhood in which the majority of your ﬁfty nearest neighbors did not have college degrees? Seven points maximum. Score 4 points if you answered “yes” plus a bonus point for every ﬁve years you have lived in such a place up to ﬁfteen years. This was true in the neighborhood I grew up in. On my street, for example, the most educated people, other than my parents (who had a B.Eng. and B.S., respectively) were high-school teachers. Colonel Hill across the street, an alcoholic, had a high school education, the next-door neighbor was a retired farmer, and in the family two doors down, the father drove a gasoline transport truck (often parked in front of the house), and the mother had a lower-level job in a mental health institution. In the latter two families, it is not clear if any of the adults had even finished high school. 2. Did you grow up in a family in which the chief breadwinner was not in a managerial job or a high- prestige profession (deﬁned as attorney, physician, dentist, architect, engineer, scientist, or college professor)? Seven points maximum. Score 4 points if you answered “yes” and 3 bonus points if the chief breadwinner for most or all of your childhood was in what you consider to be a blue-collar job. I get zero here. My father was an engineer. 3. Have you ever lived for at least a year in an American community under 50,000 population that is not part of a metropolitan area and is not where you went to college? Seven points maximum. 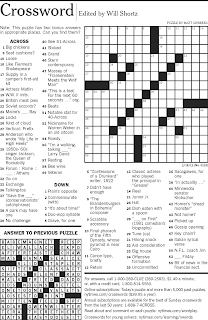 Score 5points if you answered “yes,” 6 points if the place was under 25,000, and 7 points if you lived in a town of fewer than 10,000 people or in a rural area. Bingo. About 10,000 in Cobourg, Ontario at the time: 6 points. But I actually lived in the township, outside of town, so 7 points. I went to school with many people who lived on farms. 4. Have you ever lived for at least a year in the United States at a family income that was close to or below the poverty line? You may answer “yes” if your family income then was below $30,000 in 2010 dollars. Graduate school doesn’t count. Living unemployed with your family after college doesn’t count. Seven points maximum. Score 5 points if you answered “yes” and two bonus points if you experienced poverty both as a child and as an adult. 5 points here. Though my father seemed busy with an engineering consulting business, he had a pet project - the local radio station - which he owned and poured his own money into. In spite of siphoning much of his consulting income into this operation, Radio CHUC, Cobourg Ontario, ran on a shoestring. One of my father's former employees who came to my father's funeral told me that his paycheck bounced more than once. 5. Have you ever walked on a factory ﬂoor? Six points maximum. Score 2 points for “yes,” 4 points if you have ever had a job that entailed routine visits to factory ﬂoors, and 6 points if you have worked on a factory ﬂoor. Not only did I work on several factory floors, I also did hard labor out of doors. I was a union member. Why didn't he add points for that? 6 points. 6. Have you ever held a job that caused something to hurt at the end of the day? Six points maximum. Score 3 points if you answered“yes,” add 2 bonus points if the job lasted longer than a summer, and a bonus point if you’re talking about a job that made you ache all over. I had three different jobs that hurt badly (stacking concrete blocks, sanding gun stocks, loading meat). Loading meat (quarters of beef) made me hurt all over. 4 points. 7. Have you ever had a close friend who was an evangelical Christian? Four points maximum. Score 2 points if you answered “yes,” and 4 points if you are an evangelical Christian yourself. My closest friend in the world, my sister, is indeed an evangelical Christian. She also holds a math degree from McGill University. What do you think of that? 4 points. 8. Do you now have a close friend with whom you have strong and wide-ranging political disagreements? Four points maximum. Score 2 points if you have one such close friend, 4 points if you havemore than one, but not if they are disagreements within the same side of the political spectrum (no points if you are a liberal who has an ultraliberal friend or a conservative with an ultraconservative friend). This is a bit of a strange one. My brother is a conservative, Roman Catholic Albertan. I have strong and wide-ranging disagreements with him, but these are not voiced. We are very tolerant of each other, which I think should qualify me for bonus points. But I'll just take 4, as I certainly have many friends like this - some famous ones even. My friend Bob Dawe was a C student, though I think he eventually graduated high school. Sadly, I heard the other day that he had died. Score 4 for Smiley. My son smokes. I don't like it, but I tolerate it, and the smell of cigarette smoke does not actually bother me. My friends all smoked where I grew up (including Smiley). Score 3. 11. What military ranks are denoted by these ﬁve insignia? On this one I have no idea: zero. Don't know who this is: zero. Option 2: Have you ever purchased Avon products? 15. During the last ﬁve years, have you or your spouse gone ﬁshing? Twopoints maximum. Score 1 point for “yes” and 2 points if you or your spouse go ﬁshing more than once a year. No, I don't go fishing. I've paddled canoes frequently though, so what about that? Zero, though, I guess. 16. How many times in the last year have you eaten at one of the following restaurant chains? Applebee’s, Wafﬂe House, Denny’s, IHOP, Chili’s, Outback Steakhouse, Ruby Tuesday, T.G.I. Friday’s, Ponderosa Steakhouse. Four points maximum. Score a point for each time you ate at one of them up to 4. I ate in a Chili's in an airport during the last year: 1 point. 17. In secondary school, did you letter in anything? Two points maxi-mum. Score 2 points if you got any high school varsity letter except for the debating team or chess club. Score 2 points if you were a cheerleader or in the marching band. I'm giving myself 2 points for marching band. I was in the band, which was mostly a concert band, but on rare occasions we did march. I was actually in a marching band at Queen's University, so that makes me feel better about the 2 points. Note here that my school had no "letters," nor did it have a debate club, or a chess club. My father was a proud member of the Rotary Club, and took me there on several occasions. I even went to a Rotary convention in Maple Leaf Gardens with my father. 2 points. Yes, our school band once played in the Cobourg Santa Claus Parade, on a float (of sorts). 2 points. 20. Since leaving school, have you ever worn a uniform? Two points maximum. Score 1 for “yes,” a bonus point if you did so as part of your job, and a third point if it was while you served in the armedforces. What about coveralls? I wore those in the meat plant. What about a hard hat? Wore that. What about safety goggles? Wore those too. What about a hair net? That too. Zero points on this one though. 21. Have you ever ridden on a long-distance bus (e.g., Greyhound,Trailways) or hitchhiked for a trip of ﬁfty miles or more? Two points maximum. Score 1 point for having used each form of transportation. I have taken trips on buses, and hitchhiked extensively in the 1970s. One trip I made a number of times in 1972-73 was from Cobourg Ontario to the University of Western Ontario - about 200 miles one way for weekends to see my then-girlfriend. Richard Moses and I hitched from Cobourg to Newfoundland (ferry from Cape Breton included) and back once. 23. During the 2009–10 television season, how many of the following series did you watch regularly? American Idol, Undercover Boss, The Big Bang Theory, Grey’s Anatomy, Lost, House, Desperate Housewives, Two and a Half Men, The Ofﬁce, Survivor. Four points maximum. Score a point for each series up to 4. House, The Office. 2 points. 24. Have you ever watched an Oprah, Dr. Phil, or Judge Judy show all the way through? Four points maximum. Score 1 point for each of the three for which you have watched an entire episode and a bonus point if you watch any of them regularly. 25. What does the word Branson mean to you? Four points maximum. Score 2 points if you knew that Branson is a big entertainment center in the Midwest, and 4 points if you’ve gone to Branson yourself. This is easy. I live in Missouri. I know what it is. 2 points. Some of the questions made specific reference to the United States, but what the heck, Canada is about the same as that anyway. 1. A lifelong resident of a working class neighborhood: 48-99 with typical score of 77. 2. A first-generation middle-class person with working-class parents: 42-100 with a typical score of 66. Actually, as mentioned above, both of my parents had bachelor's degrees from McGill University. My father was an engineer, my mother a chemist. On my mother's side of the family, by grandfather had a medical degree, and my grandmother had a B.A., both from McGill University. My father's parents were working class Montrealers. Thus I would not call us working class. We were rich in human capital, worked like everyone else, and sometimes did not have much income. Thus, I had to work at low-skilled jobs to get myself educated. Currently I live in a relatively wealthy neighborhood in St. Louis, and I believe I am in the top 1%. Kind of a silly test, right? This post will use Jim Bullard's speech on Monday February 6, and Paul Krugman's NYT column on the same date as a starting point. Before discussing Jim Bullard's speech, I should reveal my connection to him. Here in St. Louis, we have an excellent working relationship between the economics department at Wash U and the research department at the St. Louis Fed. The relationship is mutually beneficial. Research is better at both institutions as a result. At the University, we can hire better people because those people know that they can interact with the economists at the Fed, and the Fed can hire better people than otherwise because those people know that they can have contact with Wash U. We have a joint seminar in macroeconomics that alternates between the Wash U campus and the Fed. A large number of people in our department have arrangements to do some work for the St. Louis Fed. This includes me. My work consists of visiting the St. Louis Fed about one day a week as a Research Fellow. I have an office there, and when I am at the Fed I talk to my colleagues there about research and other matters of concern to us (e.g. recruiting), I attend seminars and conferences, and I attend informal policy meetings at which Jim Bullard is present. Academics who visit the Fed do not attend formal policy meetings - e.g. briefings for FOMC meetings. We do not have security clearance for such meetings, are completely out of the loop on what transpires at those meetings, and we know nothing of what goes on at the FOMC meetings in D.C. Jim Bullard and I are friends. We have known each other for a long time through our interactions in the economics profession - at conferences principally. Until last year when my youngest son and Jim's daughter were graduating seniors at Clayton High School (and in some of the same classes), we were also Clayton High School parents, and we would see each other frequently at school events. Thus, this is something of an inside job, but trust me. I'm going to be objective. Jim has come into his own as a central banker since he took on the job as President of the St. Louis Fed. If you have ever seen him speak in public, you know that his grasp of policy issues is excellent, as are his communication skills. Jim can stand up in front of a sizable audience, speak extemporaneously about current policy issues, and make perfect sense, to high-end economists and lay people alike. His foot always stays out of his mouth, even with press people in the room (who can be fond of taking remarks out of context). He is relaxed, has first-rate people skills, and does a lot to inspire confidence in the institution. This is a well-crafted work. There is plenty of language in there that will help to make the ideas comprehensible to a lay person, and the ideas are important. The basic ideas in Jim's speech are as follows. The Fed has adopted flexible inflation targeting. What this means is that the target for the annual rate of increase in the raw pce deflator is 2%, but the Fed is willing to shade the target up or down, depending on the "output gap." If real GDP is deemed to be too low, the inflation target should be higher than 2%, and if real GDP is deemed to be too high, the inflation target should be lower. The idea here is often formulated in terms of a "Taylor rule," which specifies how the Fed's policy interest rate should react to inflation and the output gap. The FOMC certainly does not specify an explicit rule, but some macroeconomists have argued that the Fed's historical behavior conforms to it. There is a problem with flexible inflation targeting and Taylor rules. We cannot measure the output gap directly. To measure the gap we need a model. New Keynesians have a well-defined notion of what the output gap is. In a New Keynesian model with sticky prices and/or wages, there is an inefficiency due to relative price distortions. Efficient output is the level of aggregate GDP that would have been achieved if prices and wages were perfectly flexible, everything else held constant. Thus, the output gap arises in a New Keynesian world because of sticky price and/or wage distortions. Not everyone is convinced that this stickiness matters that much in general, or matters that much now. According to the NBER, the last recession in the United States began in December 2007. So, if stickiness were an important factor in propagating the shock or shocks that caused the recession out to the current date, prices and wages would have to be VERY sticky. So sticky, in fact, as to be inconsistent with what we observe in the Bils/Klenow data or in empirical work on New Keynesian models, as far as I can tell. More than four years have passed since the onset of the recession, for Pete's sake. But maybe there is some other inefficiency that monetary policy can correct? Note the key subtlety here. The central bank needs to define the output gap not only in terms of inefficiency, but in terms of inefficiency that the central bank actually has some control over. What other sources of inefficiency have people suggested? Perhaps a key problem is some kind of "debt overhang?" Maybe people somehow accumulated an inefficient quantity of debt from, say, 2000 on? If the Fed can engineer a higher rate of inflation, then this deflates the debt and solves the problem. Of course, we then redistribute wealth from creditors to debtors. Maybe that is not such a great idea, as some of those creditors are our financial institutions, and the ultimate creditors are the banks' shareholders and depositors. I know there isn't a lot of sympathy for bankers these days, but after our financial crisis experience, we might actually be concerned about the health of our banks. But there are other ways to redistribute wealth. The obvious solution is fiscal policy, which is far more flexible in redistributing wealth than monetary policy will ever be. Now, it's hard to think of anything else in terms of central-bank-correctible inefficiencies that might exist in the current circumstances. Some people seem to think that the Fed's purchases of mortgage-backed securities somehow corrected a problem in the mortgage market. But one could argue that this simply postponed the adjustment that needed to be made in housing and mortgage markets, and represented a dangerous precedent in terms of the engineering of credit allocation by the Fed. 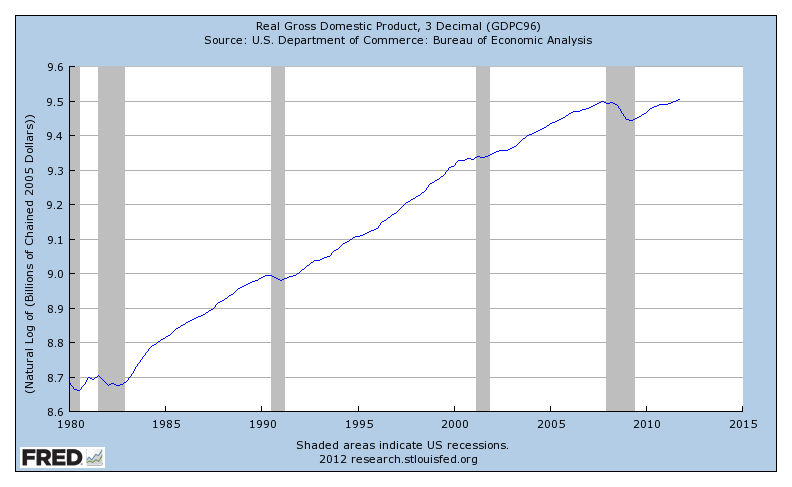 But, suppose we look at the time series of real GDP for the US, as shown in the chart (actually the natural log). That picture is quite striking. Real GDP is not bouncing back from this recession as has typically happened in the post-World War II time series. 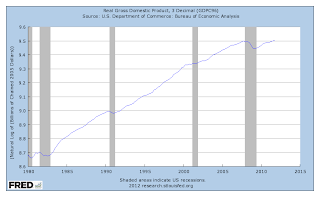 Real GDP in the US grows on trend at about 3% per year. Look in the 4th edition of my intermediate macro book, page 6. That chart shows the natural log of per capita real GDP from 1900. The striking thing about the picture is how closely the time series hugs a growth path of about 2% (i.e. about 1% average population growth and 3% average real GDP growth). Of course the Great Depression is different, but the economy is back on trend after World War II - it's as if the Depression and the War never happened, if you are just looking at the time series. But look again at the chart above. Real GDP falls below the 3% trend in the last recession, then starts growing again, but it shows no sign of wanting to come back to trend. One possibility is that we're in something like the Great Depression, except on a smaller scale. Indeed, some people have taken to calling what we are experiencing the "Lesser Depression." But that doesn't seem right, just looking at the real GDP time series. Real GDP was actually growing at a rate greater than the long-run growth rate coming out of the trough of the Great Depression. The Great Depression lasts so long mainly because the Great Depression is so deep. Real GDP per capita drops by about 29% from 1929 to 1933, and it has to grow from 1933 for a long time above the trend rate of growth to get back to the trend growth path. Coming out of the most recent recession, real GDP growth has been relatively sluggish, and our last observation (for 4th quarter 2011) was 2.8% growth - about at the trend growth rate of 3%. So, Jim Bullard explores the following idea. Perhaps the output gap is now essentially zero. Why? There was a negative wealth shock that produced a negative level effect on real GDP. We're not going to go back to the 3% real GDP growth path we were on before the recession; we're now on a lower 3% real GDP growth path. Obviously you can't say this is right or wrong, as you actually have to write down a model that's going to allow you to measure the effect. But I think the idea has merit, though perhaps you need to develop it further. Think of this as a collateral shock rather than a wealth shock - it's not quite the same thing. Under any circumstances part of the price of housing is a bubble, just like money is a bubble, for example. A house is not valued only because of the stream of future benefits it provides. It is also valued because the house serves as collateral for acquiring fungible mortgage debt. Further, that mortgage debt can be repackaged in mortgage-backed securities which also serve as collateral in financial arrangments - shadow banking for example. In fact, through the process of rehypothecation, those mortgage-backed securities can be used at any given time to support multiple credit arrangements. Thus, a given house, through a kind of multiplier effect, can support a large quantity of credit, both at the consumer level, and in sophisticated credit arrangements among large financial institutions. This all feeds back to the price of the house, potentially making the bubble component of housing prices quite large. There is nothing wrong with such a bubble in housing. Indeed, the bubble just reflects the usefulness of real estate as collateral. The problem is when you have a major lax-regulation-driven incentive problem like the one that developed post-2000. Then, part of the housing bubble is built on false pretenses, and when people ultimately catch on to what is going on, the bubble pops. I.e. 2006. So, the reason why we now have a zero output gap could be that we have lost the false-pretense part of the housing bubble. But this also implies that something else is going on. You see, with the false-pretense housing bubble we were hugging the 3% growth trend, or maybe a little worse. So maybe from 2000 on, average growth without the false-pretense bubble would have been poor relative to historical standards. That's not good news at all. A second view, more optimistic, comes from the employment report on Friday of last week. Combine this with Bullard's ideas, and maybe we get something a little better ultimately. Possibly the false-pretense bubble isn't as large as it might appear right now from the chart above. The third view is from Paul Krugman's Monday NYT column. I'm going to be a little half-hearted about this, as I've come to the conclusion that the guy isn't really worth the time I spend on him (and about time you might say). Whatever that Krugman condition was that I had, I may have actually worked through it. Krugman is a has-been academic economist and a schlock journalist, who now appears to get all his information from low-level blogs, and is out of touch with serious current economic research. Nobody is going to learn anything from him anymore, sad to say. What a waste of a fine mind. But, you might say, Krugman is so good at forecasting the future. I have never seen Krugman issue a proper forecast - one that has numbers in it. Did I ever tell you that I can forecast? I actually did it for a living once, when I was 24. I could out-forecast Krugman any day. But even if Krugman could forecast, why would we care? A really good forecaster is Laurence Meyer, whose forecasting company is in my home town, Clayton Missouri. Meyer actually has Fed experience, but I wouldn't trust him to do monetary policy if my life depended on it. He knows less about state-of-the-art macroeconomics than Krugman does. What’s the reasoning behind those demands [for tighter monetary policy]? Well, it keeps changing. Sometimes it’s about the alleged risk of inflation: every uptick in consumer prices has been met with calls for tighter money now now now. And the inflation hawks at the Fed and elsewhere seem undeterred either by the way the predicted explosion of inflation keeps not happening, or by the disastrous results last April when the European Central Bank actually did raise rates, helping to set off the current European crisis. I don't hear any strong hue and cry for tighter monetary policy right now. If the so-called inflation hawks on the FOMC felt strongly that we need tighter policy, they would have dissented at the December 2011 FOMC meeting. But they didn't. Indeed, Kocherlakota, Plosser, and Fisher voted for the action (essentially unchanged policy from the previous meeting), but Evans voted against it, as he wanted more accommodation. Thus, the committee was essentially with Krugman, and on net is dovish, not hawkish. Get your facts straight, Krugman. Of course, we know what happened in January. The Fed made an extremely risky, accommodative move. They were with Krugman again. What does he want? And every time we get a bit of good news, the purge-and-liquidate types pop up, saying that it’s time to stop focusing on job creation. Sure enough, no sooner were the new numbers out than James Bullard, the president of the St. Louis Fed, declared that the new numbers make further Fed action to promote growth unnecessary. And the sad truth is that the good jobs numbers have definitely made it less likely that the Fed will take the expansionary action it should. Read Jim Bullard's speech. The speech was given last Monday, and the jobs report came out the previous Friday. There is nothing in the speech about the jobs report. Clearly Jim Bullard's speech is about a broader issue and not about one month's information. I think Krugman never read the speech, and he guessed that it was a response to the employment report. Sloppy work, but he's willing to bad-mouth a Federal Reserve Bank President based on guesswork, in the pages of the New York Times. 1. Krugman actually says something useful. 2. Krugman attempts to discredit someone I care about in a dishonest way. 3. Krugman says something nasty about me. Then I fight back. Let's go do some economics. Bottom line here, on the "three views" issue. I think Bullard's argument has merit. If so, the FOMC decision at the January meeting - i.e. forward guidance of a near-zero policy rate out to the end of 2014 - could be a policy mistake of monumental proportions. More on that later. There is a better alternative [to other approaches to regulating bad behavior]: expanding the liability for major financial institutions. If a shareholder invests a dollar in a big bank, why not make that shareholder liable for the first $1.50 — or more — of losses as insolvency approaches? In essence, we would be making the shareholders liable for the costs that bank failures impose on society, and making the banks sort out the right mixes of activities and risks. This idea is not new. Indeed, the early 19th century Scottish banking system had unlimited liability, and there were double liability provisions in early Canadian banking. That's not really a coincidence, as the early Canadian bankers were in fact Scots. As is well known to historians, the 19th century Scottish banking system, and the Canadian banking system (in the 19th, 20th, and 21st centuries), were successes, which is obviously important. For references, first from my Google search, see this World Bank working paper, and this 1937 AER paper. From my archive, read this and this, and this. One last point. You might wonder how you get the shareholders to pay up on the extended liability provisions. That's easy. They post collateral. In the last few weeks, what began as a semi-civil battle of ideas between “saltwater” Keynesians of Krugman’s persuasion and “freshwater” economists of the Chicago school has escalated into a two-way barrage of insults and name-calling. It still is not well-understood that "freshwater" and "saltwater" are terms applied to what was going on in the field of macroeconomics in the 1970s. This post also refers to the "Chicago School." If Bloomberg Businessweek had actually figured this out, they would call the opposing movement "Minnesota Macro," Eugene Fama would not be a member of the movement, and John Cochrane would be a semi-member. If Robert Lucas were identified as a member of the Minnesota Macro movement, that would be correct. But prediction need not always be the criterion for success of an economic model. Clearly, if we are judging a forecasting model, we want it to predict well, in some well-defined sense. But in other cases forecasting is not the name of the game. In arbitrage pricing, under some assumptions the model implies that changes in asset prices cannot be successfully forecast. By the criterion of prediction, the model is indeed a total failure. It tells you that a monkey could do as well at predicting asset prices as an economist who understands the model. Yet the model is actually not a failure, as it teaches us something interesting. With financial crises, a similar issue arises. By its nature, a financial crisis is an unpredictable event. We could have an excellent model of a financial crisis. The people living in the model world where the financial crisis can happen know it can happen, but they can't predict it, otherwise they could profit in advance from that prediction. Similarly, an economist armed with the model will not be able to predict a crisis in the real world. A nice example is in Ennis and Keister (2010), which is a variant of a Diamond-Dybvig (1983) banking model. In Ennis and Keister’s world, a rational and benevolent policymaker and a set of rational consumers live in an environment where a banking panic can happen. When the policymaker sees the beginnings of a panic, he or she starts to intervene, but rationally discounts the severity of the panic until the panic is too full-blown to actually prevent. Thus, the panic can happen even if the policymaker has the right model, and the policymaker with the right model indeed cannot predict the panic.